I received an advanced copy of Shadowborn from the publisher for the purpose of an honest review. 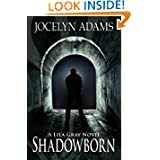 Shadowborn is the second novel in the Lila Gray trilogy. Lila is the Seelie queen who began her journey in The Glass Man while still living in the human realm. She now finds herself in a bit over her head trying to unite the Seelie and Unseelie courts when both sides hate each other. One of her biggest obstacles to find a way around began in the first novel when she fell in love with the Seelie king, Liam. It’s a problem because making their love public knowledge could easily get one or both of them killed. Talk about an emotional rollercoaster ride. I loved both of these novels. By the time I finished Shadowborn I’d become one hundred percent emotionally involved with Lila, her man troubles, and her trying to stay alive by keeping one step ahead of the bad guys trouble. Whew! I’m not going to give anything away because you need to read it yourself, but when we hit one particularly heartbreaking spot (and you’ll know it when you get there) this reader broke down and started blubbering like a baby. I ended up hiding out in the bedroom so no one would see me, kindle in one hand, box of Kleenex in the other. What I most enjoy about Jocelyn Adams’ writing is her ability to not only bring the romance to full Technicolor life with her characters, but to provide a plot that is both complex and satisfying. It managed to keep this reader always slightly off balance, which of course, kept me turning those pages until I reached the end. It was easy to suspend disbelief and imagine putting myself in Lila’s place, wondering what I would’ve done if faced with her challenges. I really can’t give this novel any less than five stars. It provided everything I could hope to find when choosing a paranormal romance and more. I can’t imagine anyone who has the same tastes in novels not loving it as much as I did. I can’t wait for the third one, though I might need this time to recover. My heart came very close to breaking on this one. Posted by Denna Holm on September 27, 2012 in Archives and tagged fae, fantasy, fantasy romance, five stars, paranormal romance, Seelie, sexual tension, Unseelie.